1. You always want to play someone better than you. You'll learn a lot more from them. 2. If you keep cheating, who's going to want to play with you next time? 3. If you don't want to play because you are losing, does that mean you can't play unless you win? Sometimes I think they understand me but still we run into this often enough so maybe I need some new mottos. I shouldn't talk either. I was such a sore loser when I was a kid. 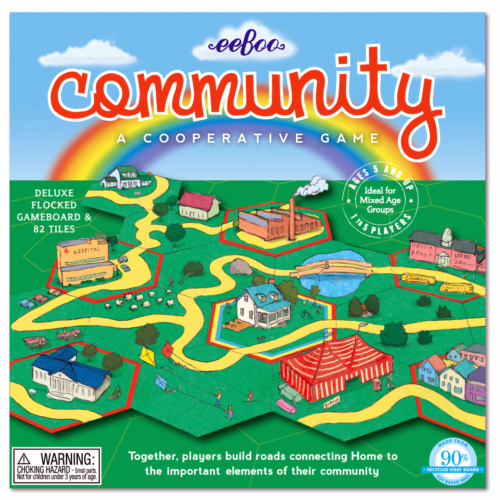 Still when I first heard about Community, a "cooperative game" where there really isn't one winner or loser, my first reaction was: Would it be fun? Well, I've tried it and all I can say is that this is the new kid on the block and once you get to know him, you will want to make him your best friend forever!!! It will surely surprise you. Do you think that Community will bring out good behavior in a kid? Sure it will! In fact, I was surprised to see it do so well with my own children. All of their games are me-against-you-games and this game was the first that wasn't and I thought they would think it weird. However, they took to it very naturally. No questions. It was only I who was unsure. I have watched my children play this with their friends and without fail, all the kids grasped the concept quite easily. The older kids did say, "No winner? Won't that be boring?" But no one says that after they play. Really! I'm not kidding. Because believe it or not, despite there being no winner, this game is challenging. It can present a bunch of problems and your child has to solve them, either on his own or with the group. 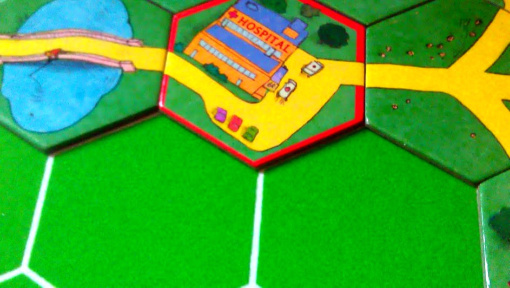 He can get help from the group but he is still responsible for his (turn) final decision, "which tile will I use to create a road?" and "which direction will I allow it to go in?" He only has three choices at a time. I was amazed how easily this very active duo of a preschooler and kindegartener took to playing this game so quietly and calmly without much support. A playdate saver!!!! What does this all mean to me? A well-planned out cooperative game like Community can allow you to see how your child is a "team player." While playing, older children may recognize that some pathways are more efficient than others and that is when you see one's skills displayed. But there are more skills to contemplate here other than visual-spatial reasoning. The other valuable skill set can be viewed when answering such questions like: Does your kid give his teammate a high-five or does your kid say, "I have the perfect piece for that spot! No one put a piece there, okay?" You can even argue if that request advances the team or if it's a purely selfish act. Moreover, you can start exploring what it means to be a leader in this context. I honestly believe this game could work in so many pediatric therapist offices such as speech and play therapy. It's got a very low-key vibe to it. It doesn't look intimidating and the roads look inviting. To me, that is the beauty of this game. There are so many ways to get to know our own and our child's core tendencies when we play this. And the good part is that our kids are young and still "moldable" and so we are able to use this game to model the kind of attitude we want them to embody. We're also able to discuss conflicts and possibly present "better" options if it is ideal to do so. I honestly think that this could be successful in just about any home. And the great part is that it is only $19.99. YEAH!!! And that is a great price if you knew what a quality game you are getting. The play area is is a lovely green flocked board (I think "flocked" means "has soft woolen surface"). This is not only awesome to touch but it also acts as a way to keep the tiles from moving around. (So smart!). That aspect is very satisfying, especially to the younger ones who may worry that their piece will move out of place. Additionally, the design is truly neither girl or boy. I really think it appeals to both sexes equally. I would suggest that you think twice about playing this with a child under five because while I have done so successfully, all of the words and the artwork on the tiles is smaller than what average five-year-olds may be used to so you'll have to keep it in mind. Still, if the child is heavily into maps like mine is, then you've got yourself a hook. This game looks like a giant map when you're finished. I did however worry about how to handle this very sticky question: What are you supposed to say when your friend says something like, "Hey I have the best tile to lead up to the library so don't put anything there okay? My tile won't make any dead ends!" However, your child may have different ideas. I honestly don't know what is ideal to say to a child in such a situation. Alison Berkley, the awesome afterschool educator and an expert at using toys as tools also looked at Community and said this to me: "There is always a compromise," she wisely pointed out. "You can always solve the problem and that is what I teach my kids every single day that no matter if you are upset, or frustrated, or you're angry, or you're just tired.. no matter what, there is always something you can do to feel better." It's something that brings people together and spans all ages. To me, that pretty much qualifies as a NO-FAIL GIFT! Notice that there aren't any "dead ends" here. (road that leads nowhere) There is no rule against dead ends but it's just something that Number 1 and I like to avoid. "You are really talking about something that all humans at all ages, need to know," Alison also said. "That you are not helpless and you are not a victim, and that if you are kind of being pushed around, you need to speak up for yourself." Wow, Alison, that is so true!!!! 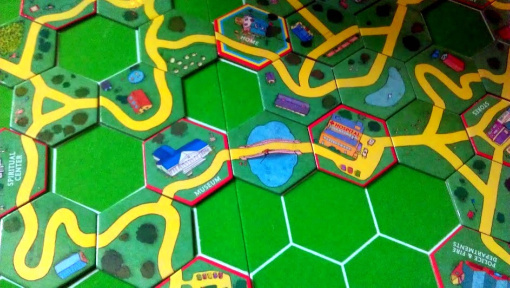 "Fundamentally, it’s all about being a problem solver, so if any game, Community or Monopoly or whatever, presents a problem, part of the game is to figure it out." "Life is All About the Journey"
These were all huge nuggets of wisdom but what about that nagging question in my head? I am still thinking about ways to solve possible conflicts where someone may usurp another's moment to contribute in his own way just because he believes he's got the better-than-best idea. Do you have a former co-worker in mind? I do. This has happened to me at different periods of my professional life. What say you Alison? Hopefully you can see how this smooth texture is not just nice to feel but useful to keep the tiles in place. "I think they are looking at wanting it perfectly," she advised me. "They are looking at the end product, and life can not be led that way - where you are constantly looking at what am I going to get at the end of this," Alison said. "Life is all about the journey, Jenn." Well said Alison!!!! 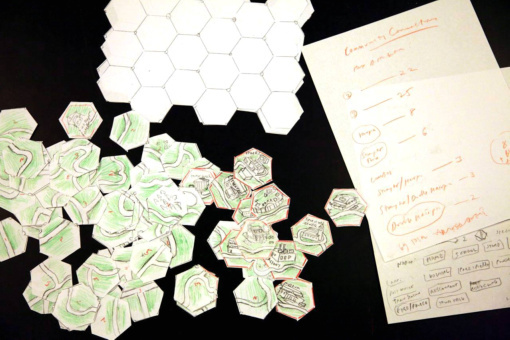 I can't think of a better way for a family to experience that idea than through a game like Community where it's all about choosing the best pathways for you and your neighbors. If there ever was a leadership building game category for kids... Community would be head of the class, for sure! Now it's time to win your own game of Community! This is a U.S. only giveaway and it ends on 12/26/12 12:01 AM. Remember to please follow the rules! Can't wait to see if you won? Buy it through my Amazon link! If you get a good deal, buy two. I received compliments after giving one as a gift! If you have a child psychologist in your life, this would make an AWESOME gift. They will be impressed with you!!! I've played some cooperative games as an adult, mostly team-building exercises that would have been just as fun for kids. And "Telephone" is a quintessential cooperative game. A cooperative game should be one were an individual's success in the game is irrelevant, where all the players are united in coming to some satisfactory conclusion or goal. I don't think I've played a cooperative game before, at least not board game type. I'm sure we must have done some activities in our church youth group. If I've played a cooperative game before, it has been a long time. I love that the entire group is involved in making the finished "product". Everyone has a chance to be involved, even the quiet ones. Games are great at teaching kids social skills. How to share, how to wait your turn, how to value other people, how to show respect... I love when the younger kids never fail to beat me at memory. Everyone has something to contribute, even when they are little. I think games can be a great way to teach social skills in a non threatening way. People can even take turns roleplaying/ modeling different aspects of social skills while they are playing. This game looks great! I don't think I've played a cooperative board game before. What a great way to build relationships and social skills! i'm not sure. good for practicing social skills, i imagine? A game kids work together on. I think they can. It teaches kids they can't always win and when they win to win graciously. After all, it's just a game! This game looks great! I am an OT and I work with children with executive functioning deficits. This would be a great game for my students to play! 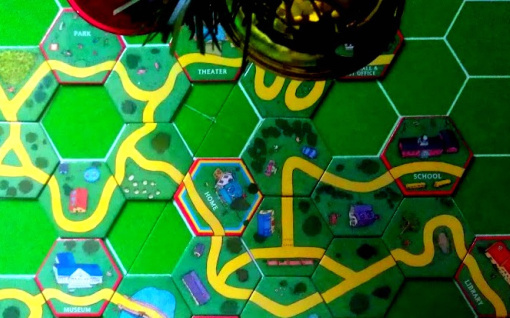 COOPERATIVE GAMES: I am a board game geek, married to another one. We have played one cooperative game, "Forbidden Island", and we LOVE it. We have given it as a gift and other people have loved it too, even a family of ruthlessly competitive brothers whose parents were initially quite skeptical. I wish there were more cooperative games around (kid and adult). Another cooperative game that gets very high praise (I haven't played it myself) is "Space Alert", in which everybody plays a different assigned role on a fictional spaceship undergoing a crisis. The game comes with a CD that you play during the game to tell you the scenario (and things like "radio communication has gone out; now you can't talk to each other"). It's supposed to be TONS of fun. I think it's supposed to be more for ages 12+, but I'm not sure. thank you so much for your insight. I have seen Forbidden Island here and there and I didn't know it was a cooperative games. I am in love with cooperative games now. I agree with you that we need a greater selection of them. they are awesome! I've played Seeds for Birds and it is an awesome cooperative game! 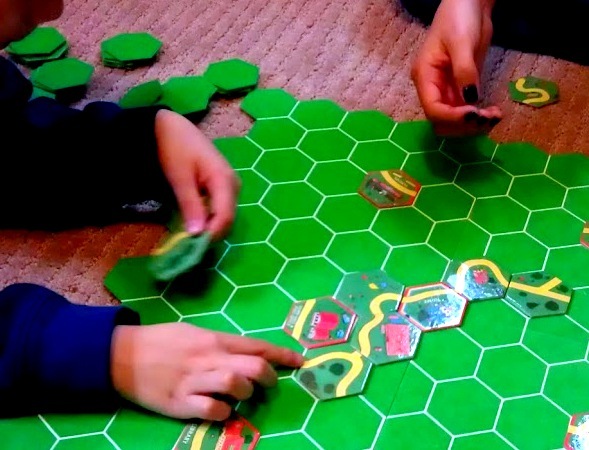 Teaches the skills of board game without the pressure of winning. 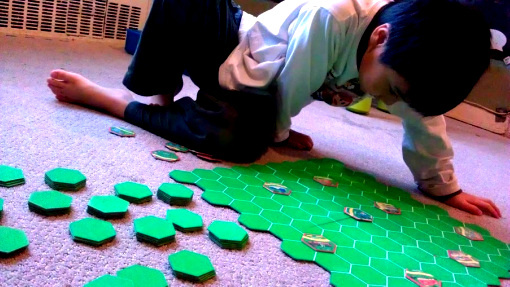 As a preschool teacher, I think cooperative games are amazing. I don't think I've really played a cooperative game. I imagine it to be a game where you need to communicate and think of others. I see this being a great tool for my boys! My oldest is one of those players that doesn't want to play if he isn't going to win. I think games are a great way to learn social skills! They can learn to take turns, have patience, and win and loose graciously.